Can You Survive This Deadly Board Game? Before we get to the new puzzles, let’s reveal the winners of last week’s. Congratulations to 👏 Daniel Borup 👏 of Champaign, Illinois, and 👏 Phoebe Cai 👏 of Cambridge, Massachusetts, our respective Express and Classic winners. You can find solutions to the previous Riddlers at the bottom of this post. First up, this week’s Riddler Express, a coin puzzle from Keith Wynroe. You place 100 coins heads up in a row and number them by position, with the coin all the way on the left No. 1 and the one on the rightmost edge No. 100. Next, for every number N, from 1 to 100, you flip over every coin whose position is a multiple of N. For example, first you’ll flip over all the coins, because every number is a multiple of 1. Then you’ll flip over all the even-numbered coins, because they’re multiples of 2. Then you’ll flip coins No. 3, 6, 9, 12 … And so on. What do the coins look like when you’re done? Specifically, which coins are heads down? Extra credit: Suppose there’s an additional rule that you cannot place the coins on adjacent spaces. What is the ideal placement now? What about the worst squares — where should you place your coins if you’re making a play for martyrdom? If you need a hint, you can try asking me nicely. Want to submit a new Riddler? Email me. Here’s the solution to last week’s Riddler Express, which asked how many paths a lowly pawn could take across a chessboard to become a mighty queen. 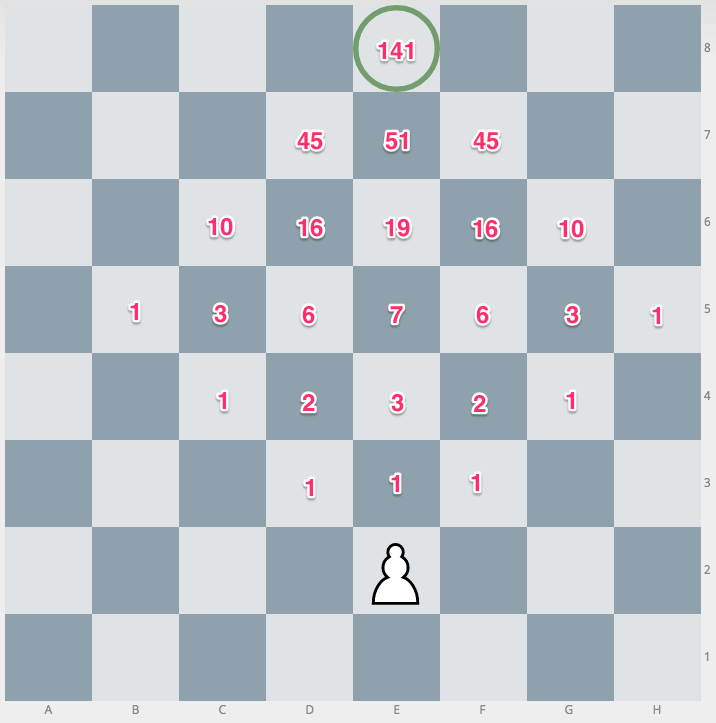 If the pawn begins on the e2 square and heads for the e8 square, there are 141 paths it could take. To calculate these, first recognize that the pawn can move in one of three directions with its first move. Then, for each new square farther up the board, the possibilities are the sum of the possibilities on the previous squares from which it can reach that new square. For example, the number of possible paths to reach e5 is the sum of the paths that reach d4, e4 and f4 (2+3+2=7). Or the number to reach d6 is the sum of those that reach c5, d5 and e5 (3+6+7=16). Keep going in that fashion, and eventually you’ll reach 141 on e8. A special shoutout to Riddler Nation’s youngest (so far) citizen, Harry. 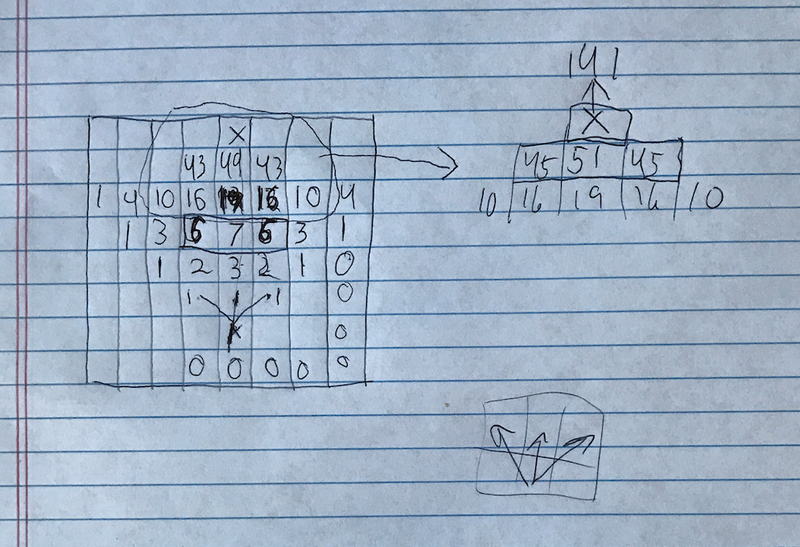 The 7-year-old’s father sent along his solution, shown in part below, which he calculated using techniques that he learned watching math videos over the summer. Bravo, Harry! And here’s the solution to last week’s Riddler Classic, concerning the paths taken around a board by various chess pieces, standard and unorthodox. The longest path a knight can take without that path intersecting itself is 35 moves. 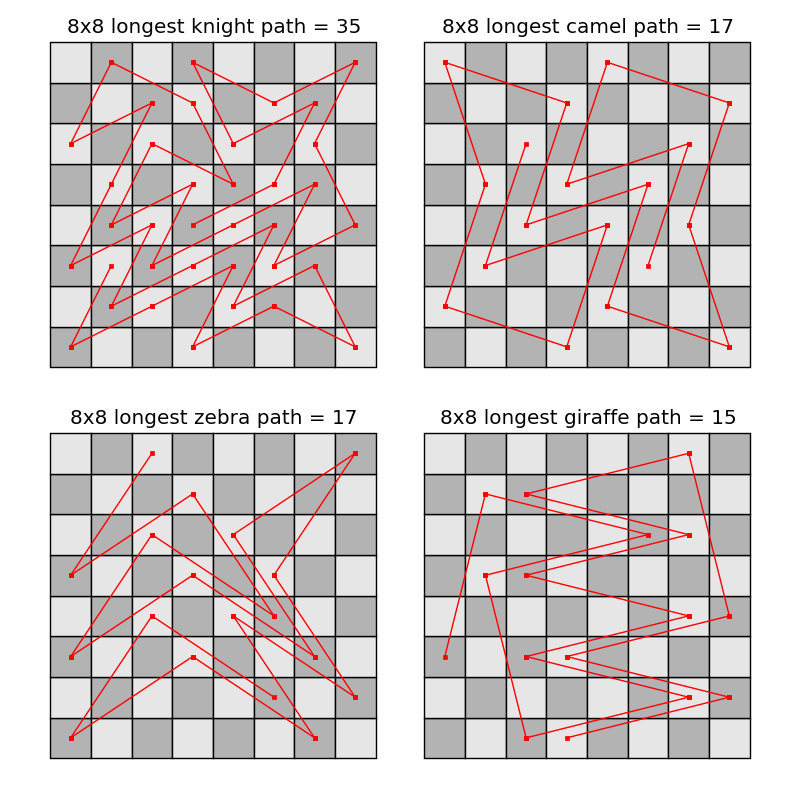 For a camel (which moves like a knight, except 3 squares by 1 square), it’s 17 moves; for a zebra (3 by 2), it’s also 17; and for a giraffe (4 by 1), it’s 15. The longest knight paths are known for boards up to size 9-by-9, and those solutions can be found in The On-Line Encyclopedia of Integer Sequences. This is a tough problem — there are lots and lots of paths a chess piece can take! — and one that’s best approached with computation. Famed computer scientist Donald Knuth tackled the knight problem in his book “Selected Papers on Fun and Games,” and there’s a lengthy article on “knight graphs” in Wolfram MathWorld. All the correct solutions I received took a programmatic approach of one kind or another. For one example, Laurent Lessard was good enough to share his Python code and describe his approach. Another correct solver, Robbie Ostrow, described his solution this way: “Recursive backtracking! Only took about 30 hours …” Thirty hours very well spent, Robbie!